"Have you been to Merci yet?" 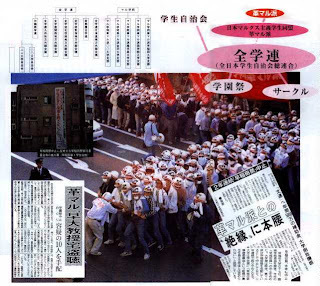 When I told a pal of mine who went to college at Waseda about this blog, that was his first question. Since then, I've gotten a few more of the same. Merci is a true institution, loved by Waseda students for generations, and for anyone who has spent time on campus here, its name is almost synonymous with the phrase "Waseda ramen." The original English-language ramen blogger, BON even reviewed the place. And yet somehow it took me 8 months to get around to eating here. Jesus, am I a poseur. Located right across the street from the Waseda subway station and just around the corner from the front gate of Waseda high school, Merci has been a favorite of students for decades. The students graduate, become alumni, and move on, but they keep coming back to Merci. They get married and give birth to baby Wasedians, and those babies become students who eat at Merci. And then THOSE students become alumni, and THEY keep coming back. Then THEIR kids grow up and start eating at Merci. Kinda like a "Hundred Years of Solitude" thing, but with less people named "Jose." And more noodles. According to a Tokyo ramen history site that I found (and from whence this pic comes), the story of Merci is the story of the life of a man named Kobayashi Hideo (who is of no relation to the literary critic of the same name). Kobayashi ran a cafe before the war, but when it burned to the ground in the firebombing of Tokyo, he took a job as a cook working for American occupation troops who had made a makeshift barracks in Shinjuku's Isetan department store. 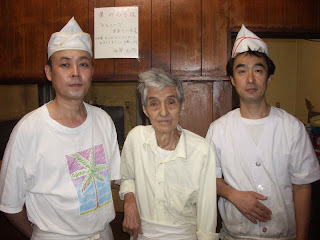 In 1958, Kobayashi opened Merci in its present incarnation, serving hamburgers, cream sodas, and light meals (karushoku). Merci moved to its present location in 1970, by which time Kobayashi had deemed the domestic population unready for hamburgers and shifted to more popular menu items like ramen, dry curry, and rice omlettes. Just a couple blocks behind Merci is the headquarters of the Kakumaru-ha (Revolutionary Faction of the Japan Revolutionary Communist League), one of Japan's most infamous radical leftist factions, who were kicked out of the student movement in the 1960s after killing members of opposing factions and engaging in general guerilla adventurist activities. I'm sure that over the years, plenty of Kakumaru-ha guys have been regulars at Merci, which has changed very little since the early 70s when the group was at their most active. They'd certainly support Kobayashi's commitment to low prices - the cost of a bowl of ramen at Merci has only gone up by 100 yen (about 1 dollar) in the past 20 years! Kobayashi Hideo turned 90 this year, and his son is now runs the business day to day, though I'm guessing that Kobayashi the elder will always be number one. Kinda like a Kim Sung-Il / Kim Jong-Il situation. Inside, Merci is all dim lighting, dark wood paneling and metal frame chairs; there's no counter, so just grab a seat at a table across from one of the manga-reading regulars. It's a bit like the Japanese equivalent of an old New York deli. I decided to dish out an extra hundred yen for one of Merci's specialty items - yasai soba, which is ramen topped with a pile of stirfried veggies like carrots, cabbage, and corn. To date, Merci is the first shop I've visited to offer a meatless topping option - props! The soup is, of course, shôyû (soy sauce), with a healty portion of sardines going into the broth. My pal had warned me that Merci is "soooo fishy," but the taste that knocked me off my feet was the pure density of the soy sauce. It might be a little salty for some, but the shôyû tare (flavor essence) at Merci is darker, richer, and more flavorful than almost any bowl I've had so far. The noodles are also dense, sproingy, and clumped together, much like down the street at Inaho, and at many other similarly old school ramen joints. Like Inaho, Merci offers a tanmen (salt soup and veggie) option, but it's the basic shôyû that's the stone cold classic here. Merci is truly an institution, and even if the noodles weren't any good, it would still be worth visiting for its historical significance. Fortunately, the ramen rocks, and where else are you gonna get a hot fresh meal for under 5 bucks in this day and age? Don't miss Merci!